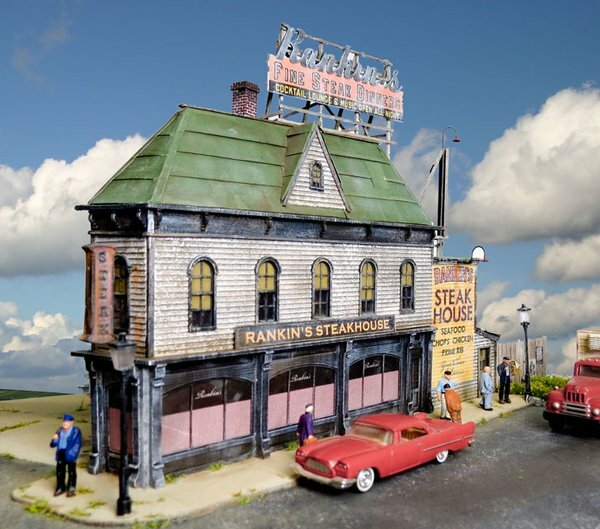 HO-SCALE RANKIN'S STEAK HOUSE - Rankin's Steakhouse is a wedge-shaped restaurant kit. Typical of many" flatiron" sites in towns where roads converged at angles, it can be the focal point of your street scene; with many interesting opportunities for additional skewed structures behind it. The kit features laser-cut clapboard walls and storefront. Also includes laser-cut sidewalk, roof cards and color signage as shown. Laser-cut roof sign lettering, metal details and plastic Tichy windows also included. Overall footprint: 4" x 7". Figures, vehicles and scenery not included.